Perhaps you remember the fairytale of the ugly duckling that turned into a beautiful swan. Chef Devaux has cooked up a similarly delightful story that teaches you how to turn a plain apple into a beautiful and delicious swan! Place your apple on a cutting board and make a cut at an angle of about 70 degrees, going through the middle and ending up at the other side of the apple. To keep it simple, check the video and simply do what Chef Devaux does. Put the bottom half with the flat side on the cutting board and place a chop stick on each side. The chop sticks will help you prevent cutting all the way through in the next step. Make the second cut a little bit off center. 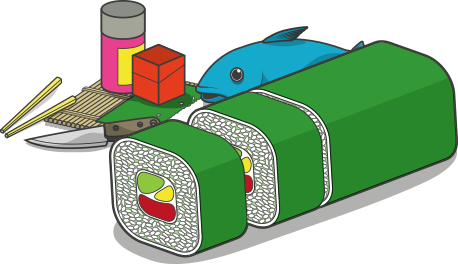 Cut until your knife reaches the chop sticks. Then make a cut across the apple by aligning your knife with the chop sticks. Cut until one part of the apple comes loose. Take the loose part and make the same kind of cut. Start 1 cm (0.4 inch) from the edge, cut down until you reach the chopsticks. Turn the apple on its side and again cut 1 cm from the edge. A new rectangular part comes loose, which will fit perfectly on the larger part. Repeat this with the remaining loose part: cut until you reach the chopsticks, turn the apple part on its side and cut until a part comes loose. Place the rectangular part on the big part of the apple and repeat the cutting with the remaining loose part. Repeat this procedure until the parts are too small to cut. In step 2 you made cuts on one side of the half apple. Now do the same on the other side. Put every loose part back on the apple. As a result, you’ll still have a half apple, except it’s cut in all the right places. Carefully slide out the loose parts of the apple. The higher the part, the more you need to slide it out. Watch the video to see how this is done. Do this with both sides of the half apple. Each side will turn into a wing simply by sliding it out! Make a cut slightly from the left side of the middle. Make a second cut slightly from the right side of the middle. Perhaps you’ll have to do some extra cutting to be able to cut this part loose. The slot opening that you’ve created this way is meant to connect the swan neck. Take the uncut half of the apple and cut off a slice of 0.5 cm (0.2 inch) thick. This part needs to have a curve in it. You can do this by first cutting off a thin slice at a slight angle. Then cut off a second slice. Again, watch the video to see how this is done. Remove the stalk and cut the slice in half. Now you need to shape one half into the head of the swan. Four cuts should do the trick. The first two cuts shape the head and neck, the other two cuts are to make the neck fit into the slot opening you’ve created in step 5. Watch the video to see exactly which cuts you have to make. When done, slide the head into the opening. The swan is nearly complete! Take an apple seed and push it against one side of the swan head. That’s one eye! Take another apple seed and push it against the other side. That’s the second eye. Congratulations. 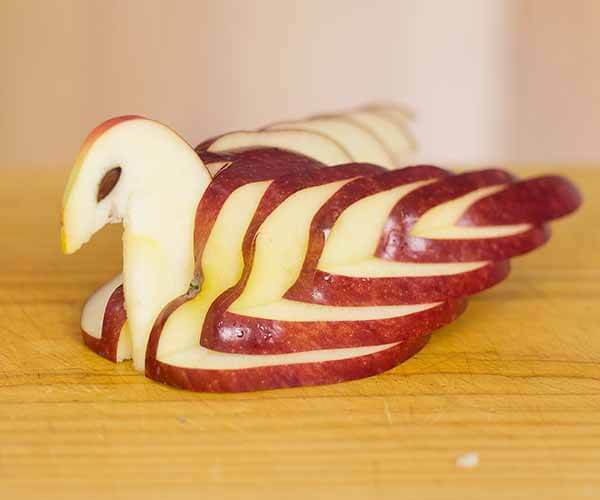 You have successfully turned an apple into a swan!